As we explore what it means to provide deal intelligence to our customers, new use cases are beginning to emerge for Mattermark. We now have 60+ customers using our tools for lead qualification. Hundreds of conversations with sales and marketing professionals has convinced us that selling into SMEs (Small & Medium sized Enterprises) is quite difficult, because it’s hard to reach them at the right time in the development of the company. An SME is an attractive target for B2B software, SaaS, PaaS and IaaS providers because it is generally less bureaucratic than a large enterprise, but still has the potential to become a very large business in the future (unlike an SMB). That lack of bureaucracy means the person you are speaking with is empowered to make buying decisions themselves, without much procurement overhead. You just have to win the deal. But to win the deal, you have to find it first — that’s where Mattermark comes in. It turns out using our own product to help us find customers has given us unique insight into what we need, and when we turn our own processes inside out we can see ways to help other businesses like us. 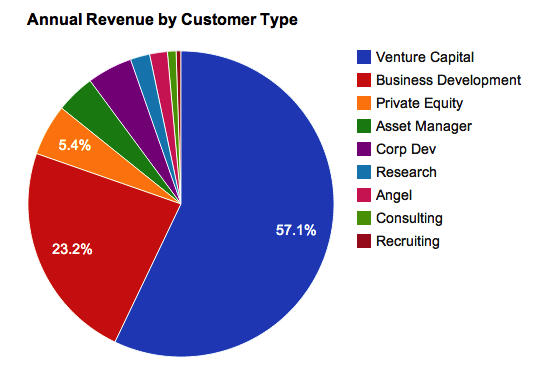 Mattermark isn’t a full stack solution for selling. We’re not a CRM (we use RelateIQ) and we’re not a marketing automation platform (we use SendWithUs) — we’re the intelligence layer that helps you fill the top of the funnel. For many B2B startups it isn’t a mystery what type of customers the business should be going after. The real challenge is getting a list of those targets and prioritizing who to go after first. Let’s say for example your company makes a SaaS product for collaboration around project management (think Asana, PivotalTracker, Slack, etc.) and you want to contact companies that can afford to pay you a little bit, and also might be reaching a size where adopting a collaboration tool has gone from “nice to have” to “must have”. The ideal target customer for you to reach out to: has the problem you’re solving, they’re willing to pay, and they’re able to pay. What started off as an interesting edge case has become core to our business now making up nearly a quarter of our annual revenue, and we’re excited to be working with more than 60 customers who are now using Mattermark to generate these highly targeted lists of potential customers. If you want to spend more time on targeted sales outreach Mattermark’s deal intelligence can help. We would love to talk with you about your SME sales outreach process, and invite you to sign up for a free trial, or reach out to me directly at danielle@mattermark.com to get set up!